OPM350L - G & W Machinery Sales, Inc. 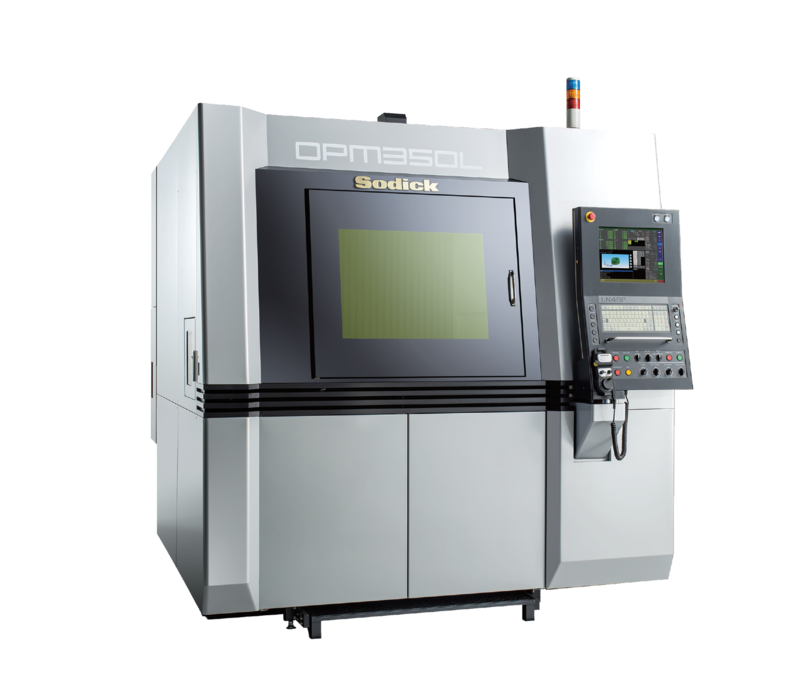 The OPM350L is a single process machine which combines laser metal sintering and high speed milling within the same workspace, allowing users to create finished 3D printed molds within a single machine. This additive technology allows not only for improved mold cooling channels and cycle times, but also streamlines mold design, significantly reducing the number of components necessary to create a complete mold. Sodick's OPM350L uniquely integrates Metal 3D Printing and traditional machining by alternating between machining and printing within the same workspace. This allows for significantly improved accuracy and finish over existing 3D printing methods, while maintaining the ability to machine complex shapes that would be impossible without additive manufacturing. The accuracy of this fully integrated design cannot be reproduced on modular 3D Printers, which apply finishing techniques only after the print has completed. These capabilities allow for significant improvements in mold design, unifying into a single mold what would previously require over 20 separate components. After machining is complete, the OPM350L collects the unused metal powder from the machining area, allowing it to be recycled back into the material supply system. By preserving unused materials, the OPM350L achieves significant cost savings and waste reduction. Sodick's OPM350L features the same rigid linear motors that have made our EDMs some of the most reliable machines on the market today. With 1G axis acceleration, and no friction, wear, or backlash, the rigid linear motor continues to be the most advanced drive system on the market. With an optimized flat design, the rigid linear motor is mounted directly into the machine's castings, providing stable linear motion with digitally controlled precision. As the experts on linear motor drives, Sodick offers one of the most accurate Metal 3D Printers on the market.